When we originally announced that we'd be providing Drupal 6 Long-Term Support, we committed to supporting our customers until February 2017. The assumption was that people would be excited about migrating straight to Drupal 8 to get the awesome new features, or ready to upgrade to Drupal 7 so they could have a fully supported site. We've definitely seen some people retire their Drupal 6 sites - we're probably past our peak of being responsible for 424 sites - but far more people have stayed on Drupal 6 than expected, and so, last year, we already announced that we'd be doing Long-Term Support until February 2018. It's already clear to us that there's enough demand to extend Long-Term Support again, until February 2019. That's the short version. ;-) Read on to find out more! But for the time-being, you can expect our Drupal 6 LTS to last until February 24th, 2019! 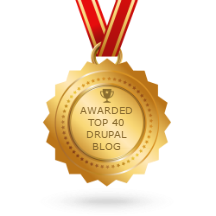 I would like to personally congratulate you as your blog myDropWizard.com has been selected by our panelist as one of the Top 40 Drupal Blogs on the web. I personally give you a high-five and want to thank you for your contribution to this world. This is the most comprehensive list of Top 40 Drupal Blogs on the internet and I’m honored to have you as part of this!